Τhe 2013 field season at the Late Bronze Age harbour city of Hala Sultan Tekke, near Larnaka International Airport has been completed. The excavations, which took place for over five weeks during May and June, were conducted under the direction of Professor Peter M. Fischer from the University of Gothenburg, Sweden. The excavations exposed hitherto unknown city quarters dating to the 14th-12th centuries BC. The size of this city is estimated between 25 and 50 ha. Only a small portion of the city, the history of which goes back to the 16th century BC, has so far been excavated. At the beginning of the 12th century BC the city was destroyed and abandoned, and never inhabited again. The discovery of a city quarter was made possible through the use of a sophisticated ground penetrating radar device in 2010 and 2012, as part of a cooperative project between the University of Gothenburg (Prof. Peter M. Fischer) and the University of Vienna (Dr Immo Trinks). A ground penetrating radar may produce “X-ray images” of the soil up to 2m beneath the surface. 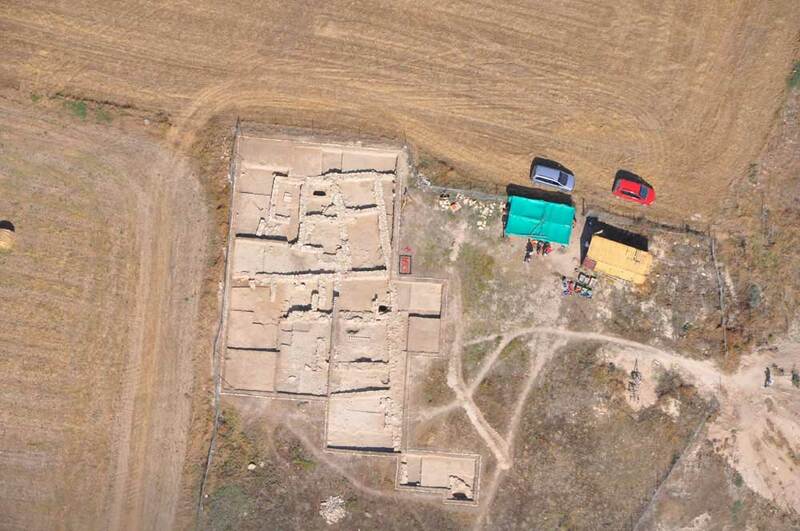 The 2013 excavations, which exposed 200 square metres of the city, confirmed the interpretation of the radar survey. The team discovered a copper production site where copper ore and hundreds of kilograms of copper slag were noted. Numerous tuyères (clay pipes), which were used to blow air into the furnace in order to raise the temperature of the copper ore and in turn to extract the copper, were also found. The copper ore and copper-rich slag was stored in deep pits before being placed in the furnace. During the digging of these pits in antiquity an old tomb was accidentally opened up and was partly emptied of its contents of human bones and grave goods. However, the team’s excavations found material that had remained in the tomb such as: ceramic vessels, bronze objects and two cylinder seals with engraved scenes: one depicting three warriors, and the other a warrior-hunter with a deer and a tree. The pottery from this tomb suggests that the tomb was built 100-200 years before it was discovered by the 14th or 13th century BC copper producers. Next to the copper production site a habitation quarter was revealed with many interesting finds including high-quality pottery such as Mycenaean imports both from mainland Greece and the Aegean islands, indicating intensive contacts between Cyprus and the Mycenaean world. In addition, several imports from the Levant were recorded. Locally produced pottery, “White Painted Wheel-made Pictorial Style”, reveals an exceptionally high level of painting especially evident in the decoration of one of the large kraters, “The Horned God Krater”. The front of the krater is decorated with a dominant figure, obviously a god, with upraised arms and wearing a horned helmet and a long dress. The figure has parallels in the bronze statues from Enkomi. Beside the horned god is a human figure holding a rope which is attached to a bull in a running pose. There are also representations of a fish and birds including a peacock. The other side of the krater is decorated with a complicated pattern of geometric motifs. The quality of the pottery and other finds associated with the copper production site demonstrate that the people who produced copper could afford such luxury goods and that they probably belonged to a high social class. Close to the copper production site a room was excavated in which large vessels were found filled with murex shells from which purple dye was extracted. The shells, in connection with finds associated with the production of textiles, such as spindle whorls and loom weights, point to the manufacturing of one of the most expensive products in the Bronze Age: purple dyed textiles. Test excavations some 50 metres to the west of the copper production site exposed a 10 m wide stone-paved street which separates the copper-producing city quarter from another part of the city. The first impression from these test excavations is that the material from this quarter predates the previously excavated quarter and possibly dates to the 14th century. Bronze was used for the manufacture of weapons, tools and jewellery. It was exported to Greece and further north-west into today’s Europe but also to the Levant, Anatolia and Egypt. The high standard of living of the Cypriots during the Bronze Age was not only a result of the production of copper but also of the export of high quality Cypriot pottery and purple textiles. In exchange, the Cypriots imported gold, silver, lead, and art objects mainly from Greece, Egypt and the Levant. There is also evidence for the import of dried fish from the Nile in Egypt.